For those of you scratching your heads, that means “Happy Virgen de la Guadalupe Day!” Actually, Tonantzín is the Náhuatl name for Mother Earth or the Earth Goddess, and what more apt description for our beautiful dusky Lady? I could sit here and expound on the history and significance of this day and all kinds of wonderful things, but I found this fab post about the topic on YucatanLiving.com I really feel brings it all together quite beautifully, with pictures and video to boot. Actually, I’m jealous of the post, but it’s a HEALTHY jealousy. So there. I want to wish you a beautiful day, and may our beloved Mamacita Querida bless us all, no matter what your religion (I hope I’m not offending anyone). PS If you’re ever in Mexico City, it’s well worth a visit to the Cathedral for a glimpse of Juan Diego’s amazing mantle. Thanks so much for the compliments. 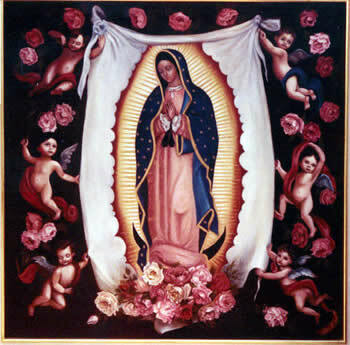 As adopted Yucatecos and Mexicanos, we have a special place in our hearts for la Virgen as well. We’re glad you like the video… we had a lot of fun filming it. Tonite, we’ll be going to a special little gathering in honor of the Virgin, just people all over the country. We’ll try to have more photos of that later. You deserve all your kudos as you have “un mar de cosas chulas” on your website – by the way, I got a kick out of reading a couple of older posts you had about a certain Madame that lived there… snarf! I looked around for the pics of the gathering you mentioned but couldn’t find them… maybe I’m looking in the wrong place? Can you send me a link, me encantaría verlas!